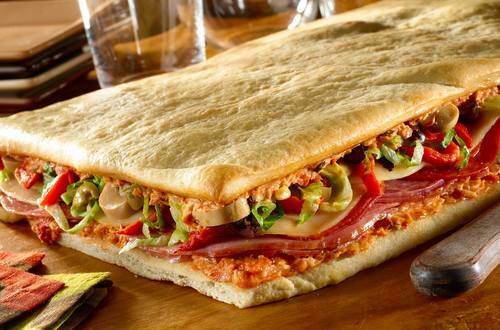 Check out how to turn your favorite pizza into a sandwich with this antipasto pizza sandwich recipe. A great idea for lunch or dinner. 1 Roll out pizza dough into two 10 x 14-inch rectangles. Bake as directed. Cool and trim edges if needed. 2 Meanwhile, process Hellmann's® or Best Foods® Real Mayonnaise, sun-dried tomatoes and artichokes in food processor until almost smooth. 3 Evenly spread mayonnaise mixture on pizza crusts. On 1 crust, layer deli meats, provolone cheese, roasted red peppers, mushrooms, olives and lettuce. Top with remaining pizza crust, mayonnaise-side down. Cut into 8 pieces.